Updated app has been working beautifully since early July. Log in details are recognized, I can download and read stories later plus the articles are displayed in a much more friendly way on my phone. 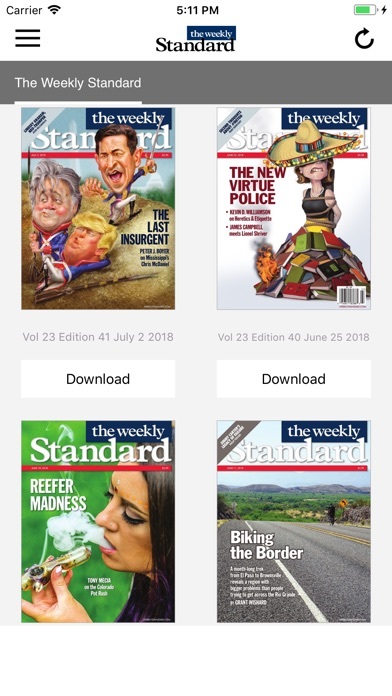 The updated Weekly Standard app does not work any better than the previous version, which means it does not work at all. The PageSuite technical support people do not seem to be at all interested in fixing this. Some things should just not be purchased through iTunes. This includes the Weekly Standard. I paid for a full year subscription the beginning of this year. In April the app stopped working and new issues wouldn’t download. Two months later the problem persists. When I call the magazine they blame Apple, and when I call Apple they blame the magazine. No one will refund my money! It doesn’t get any worse than that! 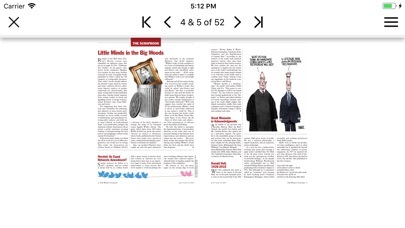 I have been a reading the Weekly Standard since it launched and on my iPad for three years until it stoped working. I paid for a yearly subscription but no new issues have loaded since April. They were no help when I called. Don’t waste your money on the digital version. App won’t load on either of my devices. Please help! TWS: When will this be fixed? The app stinks. It has never been good, but isn’t working at all now. It hasn’t downloaded a new issue this month, which I paid for. Deleting and reinstalling doesn’t help. Deleting, reinstalling, and logging in as an existing subscriber reveals the message that my subscription to The Oklahoman is good until 1969. Yay for me. Pitiful, pitiful, pitiful. May 24 update. Still not working. This kind of nonsense and indifference to readers has happened before, but not usually this long. I’ve been a reader since the mag’s first year. Pains me, but I’ve already cancelled automatic renewal. 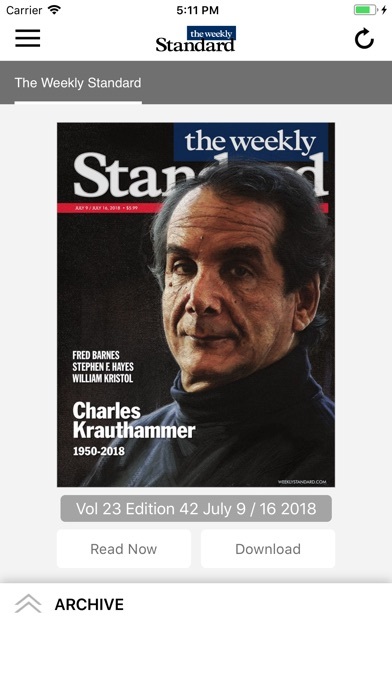 Proving once again that competent tech geeks work for Google, not conservative publishers operating on a shoe string, the people behind the Weekly Standard app have provided the worst possible smart phone interface for their magazine. To call the app buggy, glitchy or finicky would imply that it sometimes works. As of this writing, my iOS subscription gives me access to the April 2 issue, which is at least 6 issues behind. Trying to update my subscription produces this message: “Your subscription to the Oklahoman is current and will renew on December 31, 1969.” I am not making this up. A call to subscription services resulted in a nice lady reading to me over the phone a mile-long URL link for a 90-day digital subscription. As you may have guessed, the requested URL was not found. So no app, no access, no help, and I paid something like $60 for the annual subscription. This makes Trump University look like a bargain. I’m a subscriber, the app edition is stuck on the April 2 edition of the magazine . Please fix and add the current magazine edition. This app has not been updated since the April 2nd issue and I am notified that my subscription is current until 1969. It’s been kind of charming for a conservative magazine to be technically challenged, but the charm wears off. I contacted the magazine directly, but the reply claimed that there is an Apple problem. Not a good excuse for a company trying to sell a magazine. One star only because I couldn’t give it a zero. The last issue I have been able to download is the April 2, 2018, issue with John Kasicki on the cover. I deleted it, then reinstalled the app with the hope that that would fix the problem, but it did not. This is not the first time I’ve had problems downloading new issues.